Are you looking for a fun way to help your kids practice their basic math skills? 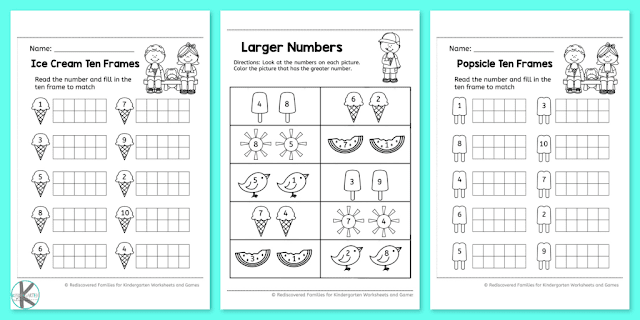 These free printable summer kindergarten counting worksheets will help your Kindergarten students practice their counting skills. WHAT IS INVOLVED IN LEARNING TO COUNT? Realizing that as you count by ones the quantity increases by one. Learning how to read and/or write numbers and understanding what those numbers symbolize. Phew that is quite a task! But the good news is that with lots of practice and support most kindergarten students will learn all these things without even realizing it. Generally speaking, children in this age group love to show off their counting skills, so they don’t need too much encouragement. There are loads of fun ways to help kindergartners practice their counting. I find it is best if you can find lots of different approaches that will appeal to a variety of learning styles. Since learning to count is such a foundational math skill we’ve put together some downloadable worksheets to help your kids practice their counting skills. Do you have any students who are struggling to learn how to count? They continue to have difficulties long after their peers master the skill? This is a classic symptom of Dyscalculia (a mathematical learning disability). Learn more about Dyscalculia. 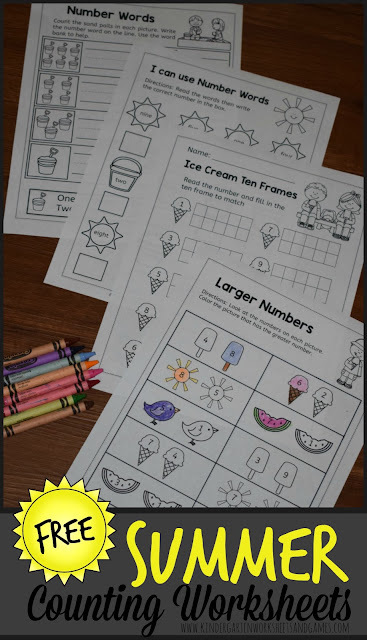 Here’s a fun summer themed freebie for your kindergarten kids. 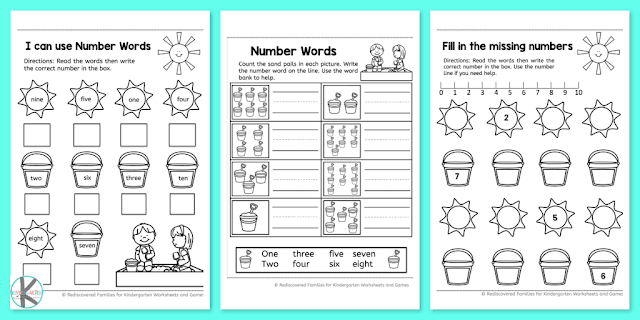 You will find six worksheets to give your students the chance practice counting. The first worksheet asks the children to fill in the missing numbers. This is a little tricky for beginners as they have to count forwards and backwards to do this. We have included a number line to help them. The second worksheets asks to use number words.Students read the number word and write the corresponding numeral in the box. The third worksheet also helps children practice using number names. Kids have to count the number of ice creams in the box and write the corresponding number name. The correct words are provided in the word bank at the bottom of the sheet. 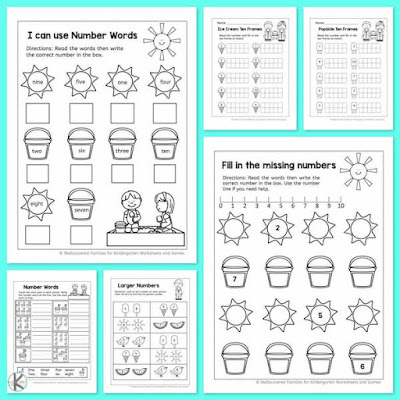 The fourth and fifth worksheets have the ever-popular ten frames. I love these, because they provide children with a visual cue, so they can see the number. Children will read the number and color in the correct number of squares to match. The last worksheet invites students to compare two numbers and pick the larger one. Children look at the numbers on each picture, compare the two, and then color the picture with the larger number.